This is the second-closest bus stop to my house. Don’t you think the owners/tenants must be lovely people? 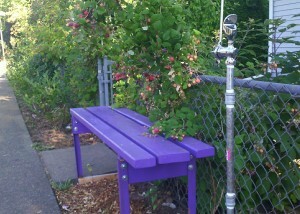 They provide not only a bench but a water fountain and fresh raspberries! There are more raspberry canes planted in the square of dirt around the bus stop sign. The first-closest bus stop to my house features a mini Australian Shepherd whose human successfully trained him not to bark at the people waiting right outside his fence, so that’s pretty impressive too. I am taking calculus this term. There is hours and hours of homework: at our last KFC meeting, I paged through my notebook and it was all algebra and trig and f(x)s. “This is what I’m doing instead of writing now,” I said pathetically, although there were plenty of KFC meetings before I started taking calculus at which I showed up with no writing. student: Oh, it was just a Jane Austen reference. George: I don’t know what that is. George: Is it a comic? student: No, she’s an eighteenth-century romance author…Pride and Prejudice? Emma? another student: It’s a girl thing. male student in front of me: yeah, those are good books. On Friday I rode the bus to work and when I got downtown I was getting close to the end of Counting by 7s, by Holly Goldberg Sloan. I tried to get my usual mile of walking in, but it started raining, and I ended up at McDonald’s, eating breakfast and finishing the book and crying over my coffee and potato triangle. It was just so awesome. I was forty minutes late to work. The experience was similar to reading The Fault In Our Stars, in that I’m blowing my nose and saying, “it’s, sooooo, gooo-ooo-oood!” and at the same time my brain is working over some things that are maybe not that good. Like, the treatment of the guidance counselor is such an odd comic note. The realism of the book in general seems to fluctuate wildly. And although I love the majority-POC cast, in the end I found the Nguyen family underdeveloped. There’s a reveal about the mom at the end, and if I had been the daughter, I would have been like, WHAT? And why had the mom made the decisions she did all along? But the book is so focused on our heroine that it was let slide. The Nguyens didn’t feel stereotyped to me, emotionally, but in the absence of more context about them, some stereotypes are the best available explanation for some things about them. Anyway, if you’ve read this book, I’d love to know if the tone and point of view worked for you, and if it made you bawl in a McDonalds or anything. By the way, I also loved it because there’s housecleaning! Very soon after I started Henry James’ The Ambassadors, it became my bus book. Bus books are the ones I really do want to finish, but they don’t make it out of my backpack when I’m home– there’s always some other book (or the internet) that grabs my attention first. They end up living in my backpack for commuting and lunch hours, and get read eventually, maybe with a non-bus rush at the end once momentum has built. Many of my bus books are classics or Good Hard Books, like the ones by my Dead Literary Boyfriends, Nabokov and James. In the case of The Ambassadors, Henry James himself told the Duchess of Sutherland to read it five pages at a time, “but don’t break the thread…& then the full charm will come out.” Some kinda nerve to give your friends their reading instructions, huh? This book was his favorite and I think he really wanted it to be liked. Anyway, five pages at a time it makes for a great bus book. When the topic is obvious and simple, his characters question one another intensely trying to determine what it is they are talking about. When the topic is strange and hidden, amazingly they all understand each other perfectly and silently. What was clearer still was that the handsome young man at her side was Chad Newsome, and what was clearest of all was that she was therefore Mademoiselle de Vionnet, that she was unmistakeably pretty–bright gentle shy happy wonderful–and that Chad now, with a consummate calculation of effect, was about to present her to his old friend’s vision. It was of Chad she was after all renewedly afraid; the strange strength of her passion was the very strength of her fear; she clung to him, Lambert Strether, as to a source of safety she had tested, and, generous graceful truthful as she might try to be, exquisite as she was, she dreaded the term of his being within reach. And Jeanne, married off to an aristocrat, goodbye, sank without a ripple like Isabel Archer. Damn. And what of Maria Gostrey? All I know is if I see someone online using the handle Maria Gostrey, I will think there’s likely an interesting person. She thought: How hard it is to change one’s life. And again she thought: How terrifyingly simple to change the lives of others. The castle was full of people standing around in that polite, sheepish way affected by people who see each other all day and are now seeing each other again in unusual social circumstances, like an office party. Wyrd Sisters will be with me at home and on the bus til I finish it, because today I gave up on another O book and bus book, George Orwell’s Keep the Aspidistra Flying. The protagonist was too angry-sad-sack, a la Lucky Jim, and I didn’t want to spend one more minute with him. Last week, and most of the week before that, I poured all my time into my final project for the IPRC Certificate program. I finished the revisions to my story last weekend, working all day both days; then every day after work I went to the university computer lab and laid out the InDesign files for text block and cover. Several days I stayed until the lab closed at nine. I was so tired after putting in three to five hours of extra work every day. Remind me to always work part time if possible! I’m not sure if it’s just how I am, or the nature of the chapbook-making process, or a function of this particular project, but everything seemed riddled with errors. Files did not get saved where I thought I’d saved them (though I found them all in the end), the margins and page numbers ended up inconsistent after I did the impositions for the large folded signatures, a couple of the fold-and-cut guidelines I printed on the inside of the cover turned out to be wrong, et cetera. I had a last-minute endpaper change after my waxed paper idea did not work out. An hour before deadline I was at the IPRC, trying to finesse the stack cutter and in the process ruining a few of the copies I had lovingly sewn and glued. But I made it and turned in my two copies, phew! And I have plenty of materials to make more when I’ve had a little rest. Graduation was yesterday, at a dance studio on Belmont. My run of errors continued and I was late, after walking a half mile to the bus stop and realizing while I stood there that I had no money or bus pass and had to walk home and back to the bus stop again. Sheesh. At least it was a sunny, pretty day. So now I am fledged and certified in the writing and independent publishing of fiction and nonfiction! I appreciate a lot of things about the program. The writing workshop was good while it lasted, though I was sorry to see it fall by the wayside during production term. I got to see enough of letterpress and screenprinting to appreciate the art forms, and to know that I’m more of a digital girl. I got acquainted with InDesign and basic hand-binding. E-books were completely foreign to me before, and now I feel I could format my work for Kindle or other e-readers. And, as Justin the director pointed out at graduation, we don’t have to all move away and leave school–we can keep on cranking out our work at the IPRC for years. Last Saturday when I was in revision hell with my final-project story, I broke away to go to volunteer training at the university. I learned the basics of being a line judge for goalball, and today I volunteered at the regional tournament finals. It was exactly what I needed as a counterpoint to my obsessive chapbook-making– a completely unfamiliar sport, the necessity of paying attention and hustling (the clock doesn’t always stop while I’m dealing with the ball), and being around people in a way that is not too much about me. And the games today were exciting! Three players to a team, wearing eyeshades to block all vision, on a court about the size you’d see for volleyball, but with no net and with a goal that stretches across the entire back line. Court markings are laid out in tape with cord underneath, so the players can feel where they are. The ball is basketball-sized, kind of hard and heavy, with jingly bells inside. 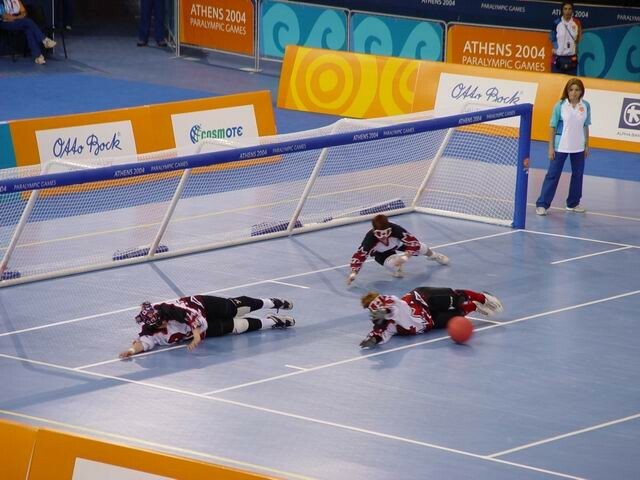 The teams throw the ball, low (it has to bounce before a certain line on the court, and the goal is only about four feet tall), trying to make goals, while the defensive players dive, stretch out, and otherwise try to block. A lot of the players, especially the men, do a twirling discus-type throw that produces a lot of velocity and spin. Scores tend to be in the three-to-eight point range, higher than soccer but not much. There were six matches this morning, and my feet were very tired by the end from all the standing and shifting and running. But totally worth it.